Students from the College of Health and Human Development celebrate their Commencement on Monday, May 23, 2016. Photo by Lee Choo. Diversity research shows that when well managed, the more diverse the group working together is, the better the outcomes will be because of the variety of perspectives represented within the team. California State University, Northridge is being lauded for its efforts in this regard, and for the steps it has taken toward building a diverse and inclusive campus community with Insight into Diversity’s Higher Education Excellence in Diversity (HEED) award, the only recognition of its kind in the nation. CSUN’s chief diversity officer Raji Rhys explained the award is given to institutions that are holistic in their approaches to diversity. CSUN’s long tradition of serving as a gateway for access and opportunity played a key role in CSUN being recognized with the HEED award. 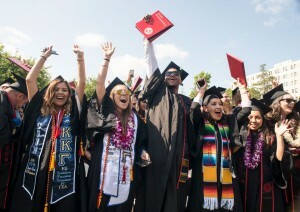 CSUN is top-ranked in total Pell Grant money awarded to students, enrolls the largest number of deaf and hard-of-hearing students of any public university in the United States, and one of the biggest populations of international students in the California State University system. The intensive and rigorous application process for the HEED award also examined how CSUN puts diversity to work to enhance academic excellence and produce educational benefits for its students. CSUN was one of the first universities in the nation to establish ethnic studies programs, including Chicana/o studies, Africana studies, and Central American studies and also established one of the first assistive technology conferences in the world. Most recently, the National Institutes of Health awarded CSUN $21.8 million to help close the nation’s science, technology, engineering and mathematics (STEM) innovation deficit and put an end to health disparities by diversifying our nation’s biomedical workforce. Rhys said collective diversity raises the university’s academic and professional success.